Thermography is the science of thermal imaging. A full definition can be found on wikipedia , but put simply it is the use of Infrared Cameras to create images – it differs from the security and CCTV aspect of thermal imaging in that in many cases the information is enhanced to provide additional data – typically temperature or radiance, where every pixel has a calibrated value. The cameras are further enhanced by adding psuedo-colour palettes to improve the contrast and help highlight thermal differences. Thermal Imaging has typically been divided into 3 wavebands – Near Infrared (NIR) or Shortwave (SWIR), running from the top end of the visible spectrum (1.0um) to approx 2.4um, Mediumwave Infarred (MWIR) in the band 2.5um to 5.4um and Longwave Infrared (LWIR) in the band 7.0um to 14um. There are a variety of reasons for this but basically one reason is associated with the absorption of IR radiation by water vapour in the atmosphere and more importantly, the various detectors used are typically only sensitive in limited bands, depending on their material properties and structures. Detectors in the NIR are either CMOS or CCD, or can be FPA using exotic materials such as InGaAs (Indium Gallium Arsenide). While the former two are relatively inexpensive to produce – and are in fact used in many commercial video cameras evidenced by the “night mode”, the latter is much more sensitive, and access to the detectors is governed by strict export controls due to the nature of certain defence applications. Detectors in the MWIR and LWIR bands are typically FPA type detectors, the MWIR variety more often photon detectors and the LWIR either micro-bolometer or QWIP (Quantum Well Infared Photodetector). 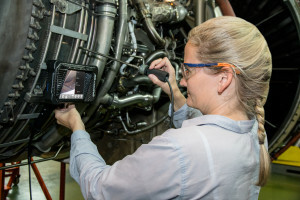 Current trends in thermal imaging have shown a huge growth in the LWIR market as the cost of manufacturing micro-bolometer based detectors has reached the economies of scale to move down the price volume curve. It is worth noting that while the MWIR and QWIP detectors used are typically very sensitive (<15mK), they require cryogenic levels of cooling – most often with small sterling engine coolers. Due to the nature of the detector design and costs of manufacture, detectors are relatively low resolution when compared to visible imaging using CCD or CMOS sensors – a high resolution industrial thermal imaging camera is of the order of 640 x 480 pixels (0.3MPixels), and low cost entry level cameras are 90 x 90 pixels (8,100 pixels). Thermal sensitivity for un-cooled cameras is approaching that of cooled cameras and NETD values of the order of 30mK at 30°C are achievable.